Play a round of Tag with the children of a city. Tag, you're it! 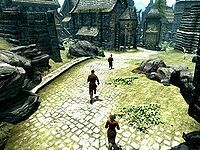 is a game that can be played with the children in Solitude, Whiterun, Riverwood, Morthal and Markarth. With Hearthfire installed, the game can be started with your adopted children as well. To play, initiate the game by offering or accepting the game from eligible children. The aim of the game is to avoid being tagged by whoever is "it". If you are it, you must try to tag someone else. The quest will update whenever "it" changes hands and quest arrows show who you can tag or who to avoid. The game ends after 90 seconds of play and the quest is removed. This has no material benefit and is mostly just for fun, but it does appear to raise the disposition of the children towards you. Entering a new area while playing the game will usually cause the game to end and you may have to speak to the children again to play. Games are only playable from 8am until 9pm. Adopted children can play tag at night if asked to. Starting a game of tag via your adopted child can cause all children in the area to play, even those who won't normally play. If you fast travel during this quest, the children may end up fast traveling with you. ? Starting a game with more than 4 children present will get all children running, but only 4 of them can be tagged. ? Objective 20: You're it! Tag someone. On the PC, it is possible to use the console to advance through the quest by entering setstage WIGamesTag stage, where stage is the number of the stage you wish to complete. It is not possible to un-complete (i.e. go back) quest stages, but it is possible to clear all stages of the quest using resetquest WIGamesTag. This page was last modified on 22 January 2017, at 10:41.